The chef of '1000 Dentra' pledges to engage you in an unrivalled gastronomic experience. 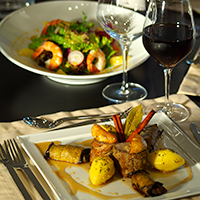 The restaurant located on the ground floor of the hotel offers an intimate setting for a culinary experience. 1000 Dentra restaurant is the ideal place for organizing a small conference with a buffet style lunch or dinner and also for casual eating during the day. Furthermore, traditional breakfast is daily served in this area with a hot section as well.